Ares will be the master distributor of PHALANX’s board games in English (worldwide, excluding Europe). 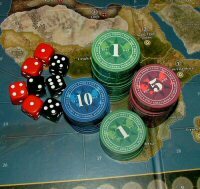 Distribution will start in November 2017, when Hannibal & Hamilcar – Rome vs. Carthage will be released. Italian company Ares Games and UK based PHALANX announce a new partnership to distribute the English edition of PHALANX games in the United States and non-European countries. Starting from November 2017, Ares will start to bring to its customers the full PHALANX catalog, including Germania Magna: Border in Flames, Hunger: The Show, and Hannibal & Hamilcar – Rome vs. Carthage – the 20th anniversary edition of one of the best two-player games ever published. Hannibal & Hamilcar – Rome vs. Carthage is renowned for its tense, well-balanced mechanics, and it tells a great story. Hannibal crossing the Alps on his herd of elephants is one of the most memorable events in history. 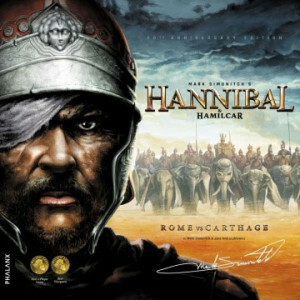 The game uses the popular card-driven system to detail the struggle between Carthage’s Hannibal and the Roman Republic in approximately 200 BC. The 20th Anniversary Edition was funded with a successful Kickstarter campaign in May 2017 – 3,514 backers pledged £263,443 to help bring this project to life, and is due to release in November 2017. The other two games from PHALANX’s portfolio to be distributed initially by Ares are Germania Magna: Border in Flames, a game of shifting alliances where each player assumes the role of a Germanic warlord leading his warriors into Roman provinces, which lie across the Rhine and Danube rivers, and Hunger: The Show, a fast-paced family game of survival on a desert island with other live TV show participants.